Very few cities in the world offer as much diversity in terms of art, architecture, natural beauty and music as the Russian capital. Here is a sampling of some of the wonderful activities on a given day in the city. Muscovites are a busy and hard-working lot and the city has its share of hustle and bustle but in the wee hours of the morning, the city can be blissfully quiet. Start off a new day with a jog from the Gorky Park to Vorobyovy Gory (Sparrow Hills) by the Moscow State University. Run parallel to the river and get inspired by the Stalin-era university building, one of the city’s famous “Seven Sisters.” This is the season when the lilacs are in bloom, so a run in the area can also be a refreshing aromatic experience. 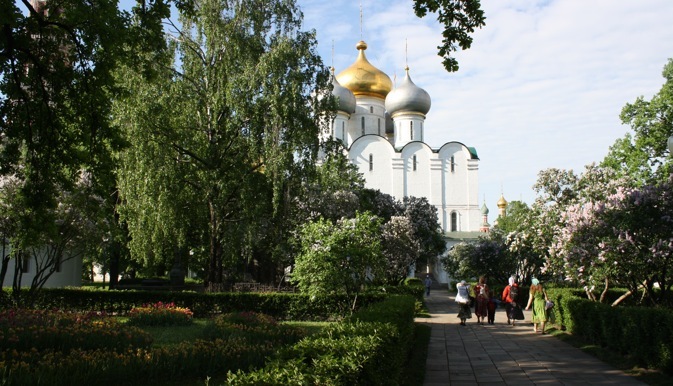 Get to the tranquillity of the Novodevichy Monastery complex long before the busloads full of tourists do. Even if you’re not a religious person, it’s worth attending the prayer service inside the Smolensk Cathedral. This is one of the few places in the Russian capital, where some of the pre-Bolshevik Revolution traditions are well preserved. Take a walk around the complex, which has a tulip garden and a collection of beautiful churches and monuments. There is a nice embankment, which is popular for walkers, fishermen and poets and offers some nice views. It’s a tranquil setting in a busy city to catch up on some reading on a good day. GUM, the large department store in the city centre that faces the Red Square, might have a huge collection of overpriced shops, but the food court on the top floor has some affordable breakfast options. Go to a Soviet-style “stolovaya” and pick up some Russian pancakes, fruits and tea and sit below the Shukhov roof and do a bit of people-watching while eating your breakfast. Enjoy the unique architecture of the building, which has elements of medieval Russia to go with steel framework and a glass roof. GUM is by no means, another ordinary shopping mall. It’s summer in Moscow and this is when the former estate of Catherine the Great is at its best. The water from the fountains rise high and the afternoon sun shines brightly on the lakes and the wooded hills of the estate. The estate has ruined gothic castles and a couple of museums, but the real charm of the place is the vast space to walk around and soak in the nature. The mad rush of Moscow seems another planet away, although the park is close enough to a metro station and is easily accessible from the city centre. Art lovers are spoilt for choice in the Russian capital. There’s the Pushkin Museum of Fine Arts, which features some of the great works of European art and the Roerich museum, which is a must for Indologists, but for those who are passionate about great Russian art, the place to visit is the Tretyakov Gallery. The great works of Vasily Vereshchagin and Isaak Levitan are this writer’s favourites. The sheer size of Vereshchagin’s ‘The Apotheosis of War,’ a painting showing a gigantic collection of skulls, can make the strongest-minded break into cold sweat. Levitan’s paintings of the Russian countryside and late-evenings in the summer can transport you back to the simpler times. The gallery also has the great works of Andrei Rublev, Ilya Repin, Ivan Shishkin and Alexei Savrasov, among other great Russian painters. Moscow’s city centre has a great collection of cafes and restaurants. Russians love their tea and love to improvise with the humble chai to make all sorts of combinations. Try a herbal tea with flowers and berries or go North African with mint. If it’s a good Assam or Darjeeling cuppa that you’re looking for with your cake, that’s also readily available. A trip to the Bolshoi Theatre is justifiably one of the highlights of a visit to Russia. Make sure you reserve a ticket in advance for a ballet like ‘Swan Lake,’ or an opera like Alexander Pushkin’s ‘Boris Godunov.’ The theatre’s opulent and tastefully restored interiors will take you back into another century. It’s summer and with late sunsets, the evening looks young even at half past ten. Soak in everything you did during the day with a nice Caucasian or Georgian dinner. Moscow has an excellent collection of fine Georgian restaurants, many of them reasonably priced. Enjoy the Georgian breads and kebabs and soups with a nice glass of wine as a perfect cap to a day in one of the greatest cities in the world. Take the Red metro line, get off at Park Kultury station and walk across to Gorky Park. Walk from Moscow State University to Universitet metro station, Red metro line. Go one station up to Sportivnaya station and walk to Novodevichy monastery. Walk from Novodevichy monastery to Sportivnaya metro station, Red line. Take the train to Okhotny Ryad station and walk to GUM. Walk to the Okhotny Ryad station. Change from Okhotny Ryad, Red line, to Teatralnaya, Green line and go on the Green line to Tsaritsyno station, then take a walk to Tsaritsyno park. Get on Tsaritsyno metro station, go to the Teatralnaya station, change to Okhotny Ryad, Red line, and go down Red line to Kropotkinskaya station, then walk to Pushkin museum. Get on Tsaritsyno metro station, go up Green line to Teatralnaya station, then change to Olkhotny ryad, Red line, and go down Red line to Kropotkinskaya station, then walk to Roerich museum. Get on Tsaritsyno metro station, go up Green line to Novokuznetskaya metro station, change to Tretyakovskaya station, Orange line, get off at Tretyakovskaya station and walk to Tretyakov gallery. Go to Okhotny Ryad metro station, Red line, or to Teatralnaya metro station, Green line, and walk across to the theatre.